Before you ask me who FatCow is, it is a web hosting provides you with one web hosting plan and one set payment term. Is that simple enough? Initially I just did some browsing at the Gobbler Hosting and get a better understanding of things such as how to choose a website hosting provider to what is disk space or bandwidth and how much do I need. 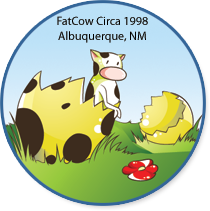 And, I happened to stumble upon FatCow which offer only one simple hosting package. Meaning I don't get confused with too many choices and all I get is inside this all-inclusive hosting plan. It's cheap, reliable, features riched, and CUTE. With $3.67/month, I'll get unlimited disk space, unlimited bandwidth, unlimited POP Mailboxes, unlimited MySQL Databases, unlimited domains hosted, and quite a few advertising vouchers to help get my website marketing started. Also, free domain for life included! I begin with asking myself the question: Do I really need a blog with better flexibility and branding potential or a blog to be hosted on its own hosting with a unique domain name? I even entered the domain that I wish to use in the box at FatCow and click "Check Domain Name" to see whether the domain is available for purchase. Ohhhhhhhhh nemind! Last chop in September then ha ha!! Am still replying via screamyx now, hey maybe u can try reply via screamyx too, see if can appear in ur box then! U have streamyx email or not? Monica taken edi mah…what else u like? I chopped cause my link text is gongs instead of singing bowls hahaaha! He he… actually outlook very good la, no need to log in to gmail, just use that terus..
Aha, apa boleh buat Mon. Monica namanya sudah femes. Cuba la gabung dua nama - "something" dengan Mon. Musti cun juga. 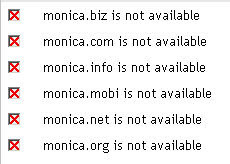 Monicalicious.com - whoaho! sounds awesome (eh, tapi nanti orang ingat lain pula)..
but i ll go something "fabulous+monica" = kena la dengan TUO. I am sure you ll come with something "cun" Mon. Uhh Huhhh.. You go Girl!! Hahaha :D Because you share the same name as hers. Can't help it. Oh TUO is at meows la today! oh no.. like that hor you got to get like MyMonica or something.. lol!! hehehe good luck with the name search dearie..
My email ok edi at MPG Mon and LJ! I forgot to tick la! Dropping meows now.. did u manage to chop at RM? Is that the singer Monica?